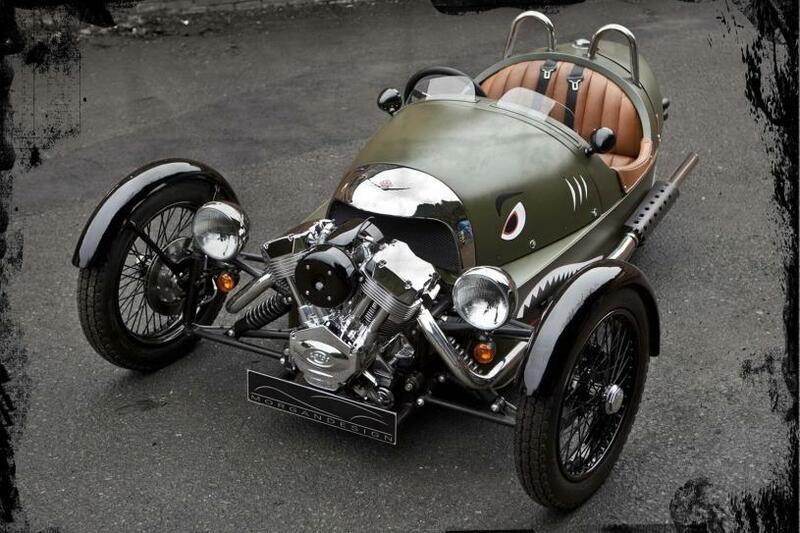 Morgan three-wheeler: Is it a car, or a tricycle? Conventional wisdom says that a car should have four wheels, but why follow the herd? If you want a free-standing vehicle with an odd number of wheels, your only real choice is a motorcycle and sidecar. That is, until now. Morgan, the British sports car company that hasn’t changed its styling since the 1940s, is bringing its new three-wheeler to the U.S.
Granted, “new” is not really the best way to describe this vehicle. Morgan started building three-wheelers in 1911; the company did not make a four-wheeled car until 1936. The three-wheeler was popular because the British government classified it as a motorcycle, and owners paid less in taxes. The new three-wheeler is a carbon copy of those early tax cheats. Despite being built by a legitimate car company in 2012, the three-wheeler looks like it came out of a 1950s hot rod shop. The wheels come from a motorcycle, as does the engine. It’s a Harley-style V-Twin made by S&S, and produces 80 horsepower. That may not sound like a lot, but the Morgan only weighs 1,155 pounds. That means the three-wheeler can accelerate from 0-62 mph (0-100 kph) in 4.5 seconds and hit a top speed of 115 mph, all while getting 45 mpg. The engine is mounted at the front of the “car” because, like most motorcycle engines, it’s air cooled. The body is there to house the fuel tank, the five-speed manual transmission from a Miata, and the driver’s legs. Since the one back wheel has no differential, the transmission is hooked up to some beveled gears that transfer the power to a rubber drive belt. Some car companies try to woo customers with Tron-like styling, but Morgan can’t be bothered with any of that. The British company’s sports cars clothe modern mechanicals in classic styling, for a genuinely retro feel. 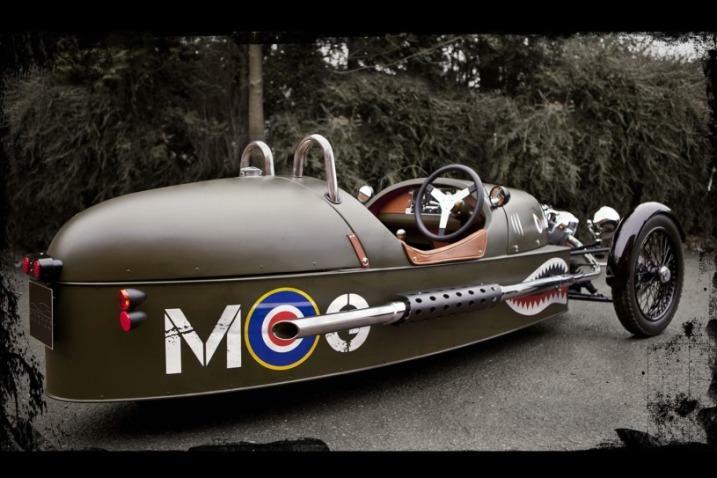 That just makes the three-wheeler’s optional shark-mouth nose art and RAF roundels all the more appropriate. Just remember to bring your bomber jacket and goggles. A little nostalgia is nice, but why bring back such an anachronistic vehicle now? Morgan was actually encouraged by an American company, Liberty, which planned to build its own three-wheelers, based on the original British design. Morgan bought in, and now Liberty’s Seattle showroom will be one of three U.S. dealers selling the reborn three-wheeler. Expect the U.S. sticker price for a three-wheeler to be around $40,000, That price includes three wheels, an engine, and a simple-but charming cockpit complete with leather upholstery and toggle switches. Remarkably, the three-wheeler is already approved for sale in the U.S. It’s lack of a four wheel, and low production volume, exempt the Morgan from most safety and emissions regulations. That’s good, because the three-wheeler probably would not fair well in a side-impact crash test. It’s hard to make sense of the three-wheeler. Is it a car, or a tricycle? One thing is certain: however you classify it, this Morgan is definitely cool.